Low built coffee tables are famous these days being the center pieces of your living room decor. And using the pallets you can make these trendy coffee tables of your own and enjoy the update fashion values in your home. 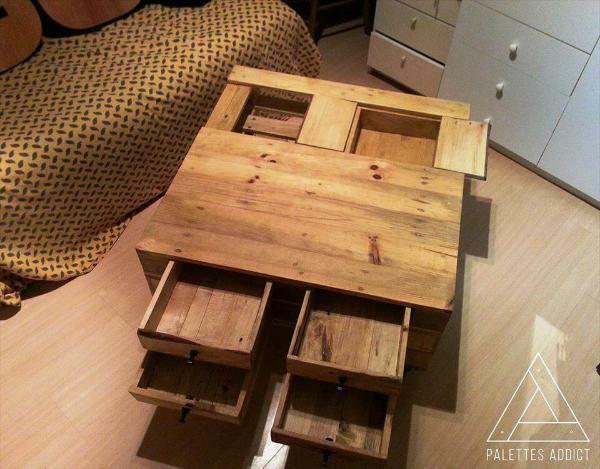 And here we offer you a lovely inspiration in this regard so check out this DIY pallet low build coffee table with drawers. Apart from being modern in design the coffee table is managed to be highly functional too. Four drawers under the top and small cute storage pockets at the top end make options for extra storage. Using the single face pallet skids this pallet coffee table has been made with simple stacking method with drawers built separately and then tucked in the empty space between the skids. Wheels at the end add more to its updated look and some vibrant hues of the stain would do more charm to it. You can choose matching hues of your living room decor to stain it so that it becomes an invincible part of your living area. 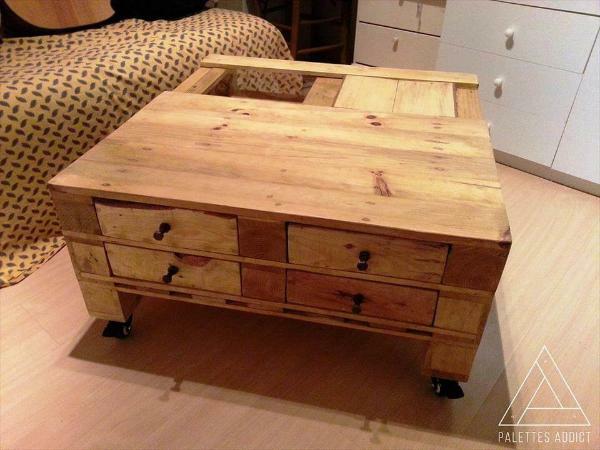 This low build coffee table would surely win your heart with its up to date design so grab the pallets to craft it in your next free time and place as the center piece of your living. Though the coffee table is small in size and low build but still its witty structure has been provided with drawers under the top to hide and house a lot thing that can clutter and damage the living are decor. 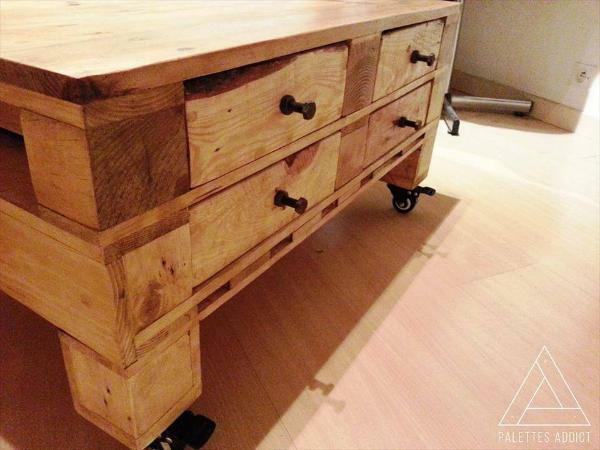 After the pallet coffee table has been built it has been sanded well but not stained so that its modern deign gets fused with the rustic and natural appeal to create an amazing look.